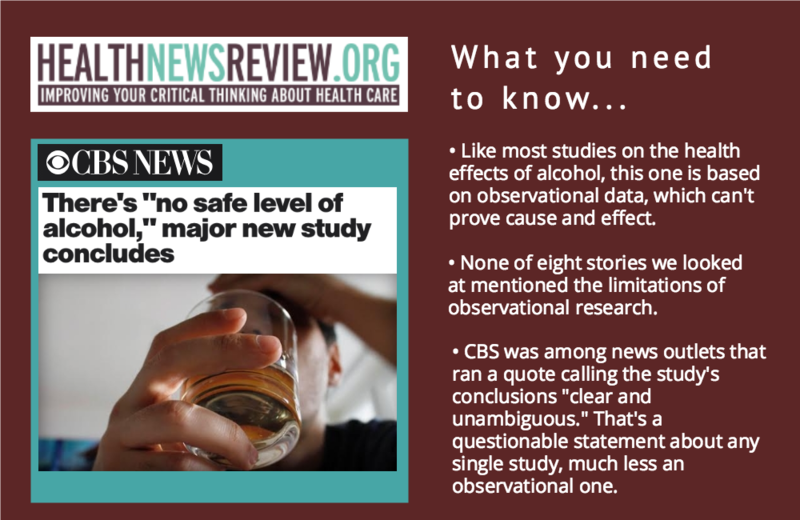 We’ve often highlighted the perils of superficial reporting on observational studies claiming to show health benefits from alcohol. 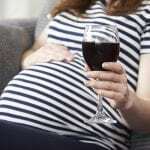 Likewise with an analysis published this week in The Lancet that focused not on the benefits but the harms of alcohol consumption, drawing on data from hundreds of studies. Of eight stories we looked at, none mentioned the weaknesses of observational data, which can’t prove cause and effect. In fact, some stories pumped up the validity of the findings, stressing that researchers attempted to correct for weaknesses in previous studies on global alcohol use. For example, Newsweek reported the lead author’s assertion that the analysis “is believed to be the largest collection of evidence on alcohol consumption, and the paper introduced several new methodological advancements to calculate the risks carried by drinking alcohol.” Newsweek offered no independent reaction. Some stories included a quote from an accompanying editorial by Dr. Robyn Burton of King’s College London who said the conclusions were “clear and unambiguous.” That is a statement that can rarely be applied to any single study, and certainly not to one based on observational data. The UK Guardian and CNN included a skeptical take from David Spiegelhalter, the Winton Professor for the Public Understanding of Risk at the University of Cambridge. He downplayed the report and accompanying calls for governments to consider recommending abstention. 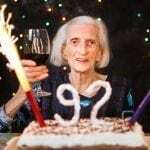 CBS newscasters, who were glum about the study (a common theme we saw), introduced the findings as “bad news for whose who enjoy a glass of wine or beer” only to end the report by noting that alcohol is part of the Mediterranean diet. “Let’s go back and study that,” one of the anchors said. As is often the case, the reality is more muddled: While this study may advance understanding about the global impact of alcohol, it comes with a few big limitations that readers need to know about. That may not make for the sexiest headlines, but it’s at least accurate.